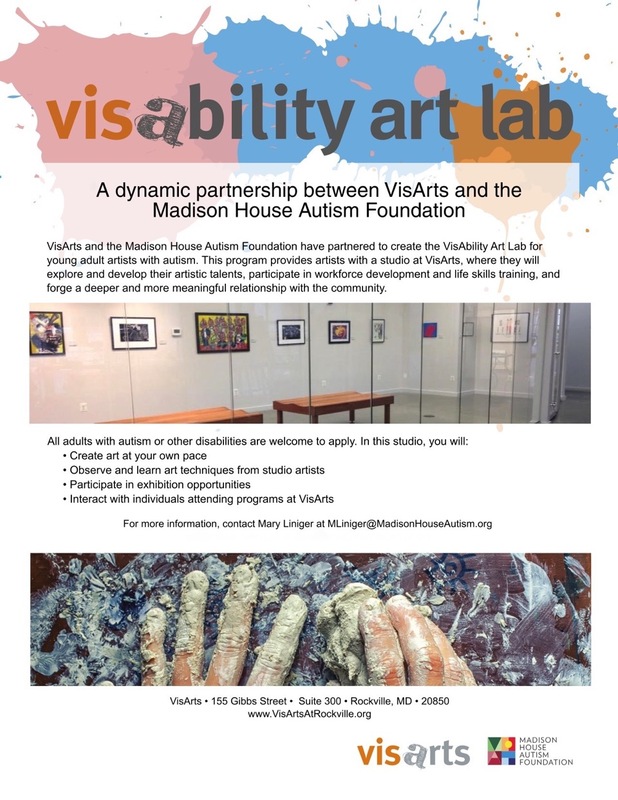 VisArts and the Madison House Autism Foundation (MHAF) have partnered together to create the VisAbility Art Lab for young adult artists with autism and other intellectual and developmental disabilities. The aim of this program is to provide artists with a studio at VisArts, a community arts organization in Rockville, Maryland, where they can explore and develop their artistic talents, participate in workforce development and life skills training, and forge a deeper and more meaningful relationship with the community. Participants create art at their own pace, observe and learn art techniques from studio artists, work with a curator on developing exhibitions, and interact with members of the public attending art classes, camps, gallery tours and artist talks. Basic life skills and workforce development training are designed to promote self-sufficiency, success in the workforce, and growth as an artist and individual. Unlike other supported studio programs for people with disabilities, the VisAbility Art Lab is fully inclusive and is integrated within the VisArts creative community. Click here to view the program flyer. For more information about the program and fees, contact Mary Liniger at [email protected]. Continue reading to apply online. Our vision for this program is simple: we are creating a place where artists with disabilities can discover and develop their talents, and thrive within a larger creative community. Artists will work and learn alongside their peers and have the opportunity to fully participate in the creative and professional opportunities at VisArts. Building on the strengths of each individual, VisAbility Art Lab expands the personal and professional horizon for its’ members, as well as increasing connections between artists both with and without disabilities. Through structured facilitation in the studio, professional development workshops and training on disability awareness, and day-to-day interaction together, both VisArts artists and staff developed an appreciation and understanding of individuals with autism. VisAbility Art Lab has already seen successes and exciting changes for our artists during our pilot program this year. One artist who previously was largely nonverbal now regularly communicates her decisions and artistic preferences, as well as her enthusiasm for her new work. Two of the three artists have had their artwork exhibited and have had opportunities to meet their new fans. The Art of Inclusion, VisAbility Art Lab’s first exhibit, featured artists from the program as well as other studios in the metro area. The opening reception attracted a broad audience of family, friends, artists, and the Rockville Town Square public. To apply, you must be an adult artist within driving distance of Rockville, MD. We will contact you within 3 business days of your submission. Please describe your medium if you chose "other" from the options above.